I decide to go for it—plant all my flower bulbs in one session. Shaking my head, I think, Ha! What a silly notion. Regardless, I set off to get the task done. Arriving in the garden, I notice some plants need dividing, the soil needs amending, and there is precious little space for my bulbs. I cannot plant all my bulbs in one session; this gardener will be lucky if I manage to plant every bulb this fall. What was I thinking when I ordered a gazillion bulbs last summer? I wonder where the time went. I thought there was six weeks to prepare the garden for the incoming bulbs, but Procrastination, my life-long friend, came to visit; the work was set aside. How many of us find ourselves facing the garden, trowel in one hand, and bags of bulbs in another, without a clue where to plant them? It has happened so often to me that I've had to find ways to overcome being overwhelmed. Just the commitment of planting those precious bulbs was enough to make me feel I may need to be committed for buying more than I could handle! Caught with bulbs on my hands, I think that the toss them and plant them method came to be when someone else was overwhelmed with not enough time or energy to plant. It sounds romantic and purposeful to plant the bulbs so that they look naturalized, but I have a sneaking suspicion that a natural look was not the only reason this method came into practice. What was I thinking when I bought too many bulbs? I imagine someone ran out of time or was too tired to plan another bed of bulbs carefully. In frustration, he tossed some bulbs. As they plopped to the ground, he thought, Good enough! Then this too-busy gardener dug in each bulb where it fell, convincing himself, Naturalized, my bulbs are naturalized. If someone comments about the placement, the gardener would say, “Oh I like the look, don’t you? Isn’t it natural looking?” Perhaps that is how the naturalized method of toss-them-and-plant-them-where-they-land came to be. I have an alternative method. When facing the dilemma of too many bulbs and not enough time, I have given bulbs away to other gardeners who give them a good home. I don’t mind being generous, especially if the bulbs will otherwise rot in their packages. However, I would rather keep them and use all the bulbs for myself. Whenever there are leftover bulbs, I grab some black gallon pots, decorative pots or any pot I can find. In the black gallon pots, I pot up many bulbs of daffodils or tulips, as many as I can place in the pot side by side, without touching each other. For plants like lilies, plant only one to three bulbs per gallon pot. In addition, I place bulbs in large or small decorative pots. Whichever way I choose, I get them planted and worry about replanting them or staging them later. I keep on hand some nice decorative pots that will contain the black, plastic gallon size pots, and larger. I use these to toss a nice looking plant in, for an instant display that disguises the ugly plastic pots they come in. When the display is over, I take the plastic pot out and replace it with another plant in bloom. This works well with perennials that bloom for a couple of weeks. When the show is over, I can plant the perennials out in the garden. It also works with bulbs. The decorative pots on my front porch mean I can stage an ever-changing plant show, with smaller pots surrounding some of the larger ones that have more permanently planted displays. This is one way to have fresh plants on the deck all summer. Anyone can do this, whether purposely or like me, in a panic of what to do with excess bulbs. Plant gallon pots with one type of bulb. 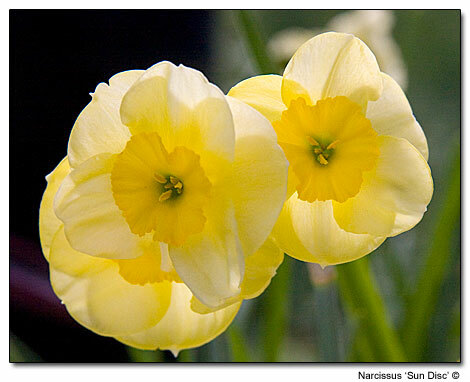 Five or six daffodils, or tulips, more or less depending on bulb size, and lilies will look great when all are blooming at the same time. Using larger pots, you can put in more varieties of bulbs. While the bulbs are developing over winter, keep the potted ones in a protected place (especially if you have squirrel problems), buried in the ground, under leaves, or an unheated cloche or greenhouse. 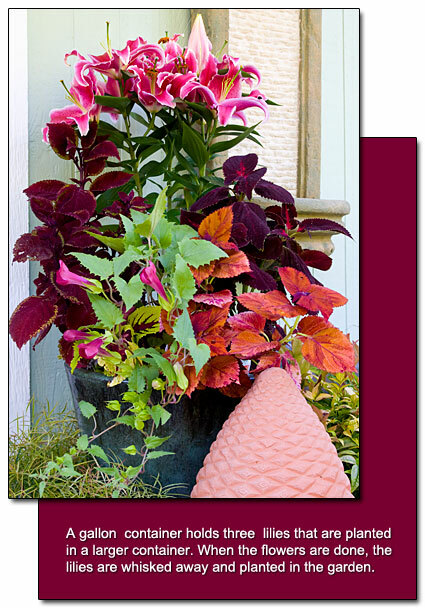 When they are ready for staging, clean the dirt off the pot, and place them inside the decorative pots. 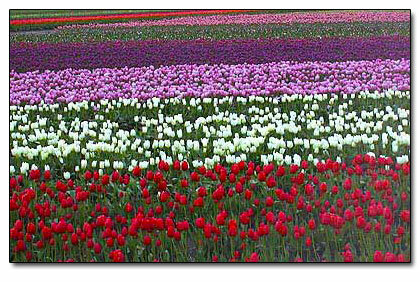 Top and bottom images photographed in author's garden; middle photo taken during the Skagit Valley Tulip Festival in Washington State.